Bargain supermarket Aldi is to sell a 40-year-old Scottish whisky with a whopping £250 discount. The whisky, casked in a Scottish distillery in 1971, will be available for £49.99 instead of the usual selling price of £300 from 8 December. But with just six or seven bottles in each store - the cut-price alcohol is expected to sell out fast. Thanks for posting this, all I'd say is the Aldi spokesman claimed that this should sell for £300. Voted hot because that's a lot of age for the money. Yep, lot of age for the money. Had a quick read of some peoples reviews who've tasted it and they say it's nice so may treat the Scottish Uncle to one of these for Xmas. Do they not like money? Saw an advert/article in paper for cut price kilts £1.99!!! ridiculous! So, 40 or so yrs ago when we took a day trip from Weymouth to France and bought two litre bottles of bells for very litle and they are still in the cupboard retained in their individual boxes could be worth a bob or two? So, 40 or so yrs ago when we took a day trip from Weymouth to France and … So, 40 or so yrs ago when we took a day trip from Weymouth to France and bought two litre bottles of bells for very litle and they are still in the cupboard retained in their individual boxes could be worth a bob or two? No, because whisky only matures in the cask and not in the bottle. They might have a small rarity value but it's unlikely to be very much. Yep, lot of age for the money. Had a quick read of some peoples reviews … Yep, lot of age for the money. Had a quick read of some peoples reviews who've tasted it and they say it's nice so may treat the Scottish Uncle to one of these for Xmas. He'll probably never talk to you again. However, buy him a bottle of Ardbeg Uigeadail for the same price and you'll become his favourite family member. No, because whisky only matures in the cask and not in the bottle. They … No, because whisky only matures in the cask and not in the bottle. They might have a small rarity value but it's unlikely to be very much. Bells is a blended whisky & think this is a single malt? Looks like i'll have to queue overnight for this!! Doubt they allow people to reserve a bottle of they only have 6 per store...but does anyone know that for sure? is this only at selected stores? can you buy online? has anyone drunk this whisky before? I think it is Aldi branded wine. So it's not reliable about the quality. Any other opinions? Is this an Aldi own label? Google only references this offer. Not my review by the way!! 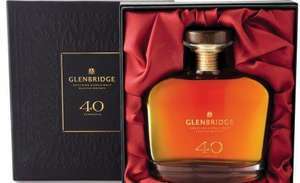 Glenbridge – 40 Year Old Speyside Single Malt Whisky – 70cl - 40% abv (£4 … Glenbridge – 40 Year Old Speyside Single Malt Whisky – 70cl - 40% abv (£49.99 from Aldi)Nose: A hint of smoke, some orange peel, marmalade / dry jaffa cake notes. New leather and wax jacket, but the overriding tone is dried orange peel.Palate: Warming, oily palate of cough sweets, orange again (the middle of a jaffa cake), some wood tones, fresh figs, melon wrapped in param ham and a wee bit of coffee.Finish: The orange lingers, developing in to cherry sweets and cracked black pepper. This whisky has been matured in European Oak Sherry casks and this really hits through on the finish, adding spices to the stewed fruits of the palate.Overall: In a word, this stuff is very tasty. Take the age statement off this and it would still be a cracking drink for £49.99. Stick it on, and you have an absolute steal of a whisky. Warning, it does fall apart a little with water.In summary, the 40 is great, esp at the price they’re knocking it out at. But sadly the 24 Years Old really isn’t that great. The biggest question is why? Why are Aldi doing this? Are they hoping to lure in people who wouldn’t normally shop there, pre-Xmas or are they wanting to reward their loyal customer base with a steal of a whisky?Either way, with only 3000 bottles across 450 stores, we'll all be pretty lucky if we get hold of one. And so it is that I wish you good luck, yet at the same time apologise in advance for my elbows in your face, as the shutter on my local Aldi rises for the sale. It's an Aldi Own-brand product and all the PR and hype has come from them - no one else. It's apparently from an un-named Speyside distillery. Save your money and buy a good brand that doesn't need a PR machine. Lol - and whether its £7 or £40 the level goes down just as quick. I'm not the only one - it was World Whisky of the Year 2009 when it was released. The stuff is ambrosia. Just trying to spread the love of good whisky; too many people are conned into thinking Glenfiddich, Chivas Regal and Johnnie Walker are the be-all and end-all of good whisky, when nothing could be further from the truth. Hard to believe that people are getting so wound up about this on the strength of a single blogger who says it's quite nice. Just because a whisky is old, it doesn't naturally follow that it's any good. If it was really that great, do you honestly believe that the distillers would have given the distribution rights to Aldi at just £50 a bottle? It's an Aldi Own-brand product and all the PR and hype has come from them … It's an Aldi Own-brand product and all the PR and hype has come from them - no one else.It's apparently from an un-named Speyside distillery.Save your money and buy a good brand that doesn't need a PR machine. I thought it was Aldi's own branding too. But Aldi didn't have a presence in the U.K in 1971 did they?? If not then surely this whiskey was brewed by another company who were later acquired by Aldi, or have a partnership agreement or something? what's the strength of the aldi £6.99 one? who sells Bergan flowers whisky? some of the discount supermarkets' spirits have a lower proof than normal. the most absurd example was in netto where i saw a vodka on the shelves. my that's cheap, i thought - until i noticed it was only 22% proof. I thought it was Aldi's own branding too. But Aldi didn't have a presence … I thought it was Aldi's own branding too. But Aldi didn't have a presence in the U.K in 1971 did they?? If not then surely this whiskey was brewed by another company who were later acquired by Aldi, or have a partnership agreement or something? It's someone else's distillery on Speyside, it doesn't say who's - they've just created their own brand as in 'Glenbridge', certainly not conceived by Aldi 40-years ago - it might be very good, but I'd prefer one I'd heard of for the same price and all the PR-hype is from them, or re-hashed copies of their press release. You can buy 40-year-old whiskey that you've heard of for just over £100. This sounds like a marketing exercise rather than a decent deal. does anybody think this will even hit the shelves, if you worked there can see a lot of staff having it.